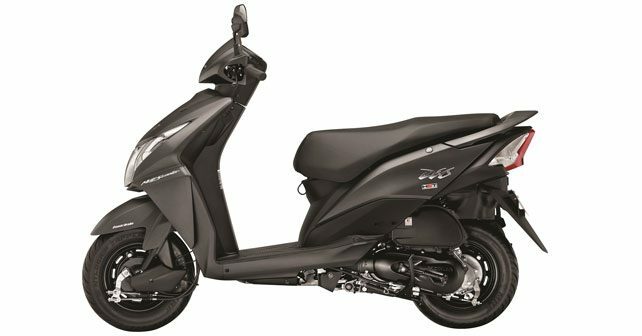 Japanese bike maker Honda has just launched the updated version of the Honda Dio. The Dio was first launched in 2002 and was designed for young customers in India. Honda has now sold over 1 million units of the Dio and to celebrate the milestone they have introduced the refreshed Dio variant. The new Dio gets a few style upgrades and will now be available with a new Matt Axis Grey colour and all models will come with a premium 3D emblem. The Dio is powered by a 109cc engine that has 8bhp and uses Honda Eco Technology. Besides the new Matte Axis Grey colour, the Dio is also available in 4 existing exotic colours - Jazzy Blue Metallic, Candy Palm Green, Sports Red and Black. The Dio has also done well in the global marketplace and the scooter is the No.1 export model of Honda 2Wheelers India. The Dio is exported to Colombia, Mexico and neighboring nations Sri Lanka and Nepal. Providing an irresistible package of style and substance, the latest style upgrade comes at no additional cost as Dio continues to be priced at Rs 48,264 (Ex-showroom, Delhi).